The paper on the SnapLoc localization system co-authored by LEAD-project PhD student Bernhard Grosswinhager received the best paper award at IEEE/ACM IPSN 2019, one of the leading conferences in the field. Also the demo accompanying the paper was a runner-up for the best demo award. A guest lecture on "Array Signal Processing Techniques" will be held by Prof. Bernard Fleury from Aalborg University, Denmark between May 27 and June 13, 2019. Further detail can be found here. Please register for the course through TUG Online. Abstract: "The scope addressed in the course is line-spectral estimation using an array of sensors. Line spectral estimation is a fundamental task that is encountered in many scientific and technical disciplines. Examples include direction of arrival estimation using sensor arrays, bearing and range estimation in synthetic aperture radar, channel estimation in wireless communications, monitoring of seismic activity, and simulation of atomic systems in molecular dynamics. The course aims at initiating the attendees into the most relevant and widely used techniques for line spectral estimation, such as beamforming, MUSIC, ESPRIT, maximum-likelihood estimation, and variational mean field. Prof. Grigore Stamatescu, Technical University of Bucharest, wins a JESH scholarship of the Austrian Academy of Sciences to visit and collaborate with the LEAD project for 8 months in 2019. Prof. Christian Poellabauer, University of Notre Dame, IN, USA, wins a Fulbright Scholarship to work as a visiting professor with the LEAD project for one semester in 2019. The ASCON crypto algorithm for resource-constrained IoT devices, which was co-developed by LEAD project associated researcher Maria Eichelseder, has been selected by an international jury and recommended to become a standard means of encryption in the IoT. Intel SGX is a recent security technology for protecting sensitive software from malware via so-called enclaves. At the same time, the strong isolation guarantees of SGX also enables malware itself to hide themselves from anti-virus software by means of enclaves. LEAD project security researchers now demonstrated the first time how malware can practically abuse SGX to gain arbitrary code execution. This emphasizes the need for more research on preventing enclave malware. The oustanding security research of LEAD project key researcher Stefan Mangard attracted SGS, a leading international test and certification company, to open a unique joint research and test center on security and IoT on TU Graz campus. On Feb 7, 2019 an international expert jury, chaired by Prof. Dr. Wolfgang Knoll, managing director of AIT, reviewed the LEAD project positively and recommends funding the second 3-year phase. The LEAD project organized the fourth edition of the Dependability Competition in conjunction with EWSN 2019 in Beijing, China. This year, 12 international teams, many of them including industry partners, were competing for the most dependable IoT networking solution. Please find more information here. The LEAD project co-organized the second edition of the Winter School on Operating Systems with a focus on dependable operating systems. The inaugural edition of the school was held 2016 in Graz, the second edition took place at Schloss Dagstuhl in Germany. Bernhard Grosswindhager, PhD student with the LEAD project, wins a Marshall Plan Scholarship for his three-month research visit at Prof. Prabal Dutta's group at UC Berkeley in fall 2018. John Hughes, the inventor of property-based testing (QuickCheck), gave a talk entitled "Abuses of property-based testing... and what to do about them". Abstract: Property-based testing is very appealing in principle: instead of writing unit tests, one at a time, we write general properties of our code, and a PBT tool will generate thousands of random test cases for each property. In practice, developers often find properties hard to come up with--but they do have ideas for unit tests. All too often, they write properties just by generalizing unit tests a little. This is both costly, and leads to poor testing. But those unit test ideas can instead be used as test case classifiers--in which case they can reveal weaknesses in property-based tests caused by a poor choice of random distributions. Thus the harmful anti-pattern becomes a helpful tool. I'll explain how this works with reference to a number of simple, but realistic examples. The LEAD project organizes the second edition of the very successful summer school on Security and Correctness in the IoT in September 2018. Please find further information here. The research of the LEAD project was featured in the "Newton" shown on IoT broadcast by the Austrian national TV station ORF. The LEAD project was organizing a Summer School on Network Systems between July 17 and 20, 2018 at TU Graz. See https://www.tugraz.at/projekte/dependable-things/events/summer-school-on-networked-systems/. Prof. Reith from RheinMain University is visiting the LEAD project from March 05 to March 23, and from June 11 to June 15 and will also offer a course on "Cryptography and Microcontrollers". Registration and details here. The LEAD project is organizing the second Symposium on Dependable Internet of Things on June 5, 2018 at TU Graz. The symposium is co-located with the IEEE Symposium on Industrial Embedded Systems (SIES) which we organize from June 6 to 8, also at TU Graz. See http://sies2018.tugraz.at. Prof. Salil Kanhere from University of New South Wales in Sydney, Australia will be a visiting researcher with the LEAD project during April 2018. His research interests encompass pervasive computing, Internet of Things, blockchain, crowdsourcing, mobile technologies, data analytics and security and privacy. See http://salilkanhere.net/. The LEAD project presented during the Long Night of Research an integrated demonstrator combining networked control (truck platooning), wireless truck localization, real-time embedded computing platform, and model-based learning and testing of platooning. Presentation by Prof. Nils Jansen on "Motion Planning under Uncertainty and Partial Observability"
Prof. Nils Jansen from Radboud University was visiting the LEAD project and gave a presentation March 7, 15:00-17:00. Location: Seminar room IAIK, IFEG042, Inffeldgasse 16a, EG. Abstract: The subject of this talk are motion planning problems where agents move inside environments that are subject to uncertainties and potentially not fully observable. The goal is to compute a strategy or a set of strategies for an agent that is guaranteed to satisfy certain safety or performance specifications. Such problems are naturally modeled by Markov decision processes (MDPs) or partially observable MDPs (POMDPs). We discuss several technical approaches, ranging from the computation of permissive strategies that guarantee safe reinforcement learning in unknown environments, a game-based abstraction framework for POMDPs, as well as the utilization of parameter synthesis for Markov chains to compute randomized strategies for POMDPs. We also consider preliminary work on actively including humans into verification and synthesis processes, and what challenges arise. Secure Computation has emerged as a central cryptographic tool to construct applications that handle sensitive data on untrusted platforms. The course gives an overview of the most common constructions, based on either homomorphic encryption or on "garbled circuits". Furthermore, the lecture will discuss prominent applications as well as programming paradigms for secure computation. BIO: Stefan Katzenbeisser received his Ph.D. in Computer Science at Vienna University of Technology and is Full Professor at the Computer Science Department at the Technische Universität Darmstadt, Germany. He is professor for Security Engineering at the department of computer science at the Technical University Darmstadt. After studying computer science at the Technical University of Vienna, he worked as a senior scientist at Philips Research in Eindhoven. Mr. Katzenbeisser is currently working on security of critical Infrastructures, secure embedded systems and issues of data protection. Two key researchers of the LEAD project are partners in the new Austrian Lighthouse Project IoT4CPS: Trustworthy Internet of Things for Cyber-Physical Systems. The public kickoff meeting has been held on February 1 at TU Vienna, where numerous participants were not only informed about the project, but actively engaged in working group discussions to identify key requirements. See https://iot4cps.at/. Prof. Martin Horn, key researcher in the LEAD project, won a prestigious grant to establish a new Christian Doppler Laboratory with a duration of up to 7 years. This new laboratory will investigate new control paradigms for test benches, and will further strengthen the LEAD sub-project on networked control. The research centre Dependable Internet of Things at TU Graz has designed a master’s degree programme in order to specialise in areas related to a dependable Internet of Things. The programme is based on the well-established master’s degree programme in Information and Computer Engineering (ICE) and offers a Major in the Internet of Things. Details can be found here: http://www.tugraz.at/go/major-iot. 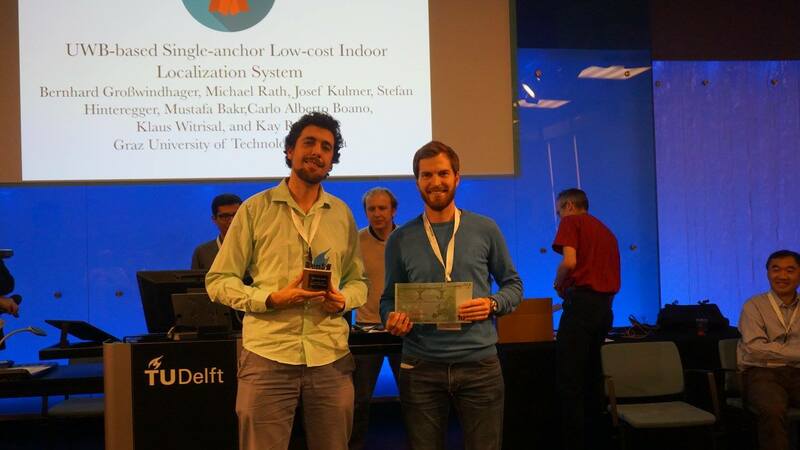 The demo entitled "UWB-based Single-anchor Low-cost Indoor Localization System" presented by Bernhard Grosswindhager and Michael Rath at the 15th ACM Conference on Embedded Networked Sensor Systems (SenSys) won the best demonstration award. The demo is the result of work in the "Dependable Wireless Communication and Localization" sub-project. Researchers from the LEAD project will organize the 3rd edition of the EWSN dependability competition to compare the performance of WSN and IoT communication protocols in harsh RF environments. A summary about the results and lessons learned from the previous editions can be found here. This year's dependability competition will have a new format compared to the past two editions, the most prominent changes being that it will take place remotely over a longer time window, and that it will involve the reporting of multiple events from several nodes. LEAD project advisory board member Prof. Karl H. Johansson (KTH Stockholm) gave an invited lecture entitled "New control and networking paradigms for cyber-physical systems" during the Colloquium of the Field of Expertise "Information, Communication & Computing", on Oct 12, 3 p.m. in lecture hall HS i3, Inffeldgasse 25D, 8010 Graz. The key researchers presented the LEAD project to about 60 rectors of European universities of technology in the course of the 36th Conference of Rectors and Presidents of European Universities of Technology that took place at TU Graz Sept 15-16, 2017. Please find details here. The “1st DependableThings Symposium” is a single-day event organized by the LEAD Project. The same venue will be hosting a Workshop on "Dependable Wireless Communications and Localization for the IoT" on Sept. 12, 2017, organized in collaboration with the COST Action IRACON (Inclusive Radio Communication Networks for 5G and Beyond). More information can be found: here and http://www.iracon.org. Prof. Kim G Larsen, Aalborg University is a visiting professor with the LEAD project. Among others, he will offer a lecture on cyber-physical systems and an invited talk on the same subject. Please find details here. We have the pleasure to announce a course held by Prof. Kim G. Larsen. Kim is prime investigator of thereal-time model checker UPPAAL, ERC Advanced Grant holder and has been cited 21778 times (h-index 71, Google Scholar). The course titled "Selected Topics in Computer Science (From Timed Automata to Stochastic Hybrid Games)” will be held as a block course from the 22nd of May to the 2nd of June. It is a combination of lecture and practicals (3 VU) and intended for doctoral and master students. The course is funded by the LEAD project Dependable Things. Details and registration here. Researchers from the LEAD project have organized the 2nd edition of the EWSN dependability competition, in which 10 teams from academia and industry have battled to provide the most dependable networking solution for wirelessly networked embedded systems operating in environments rich with radio interference. A summary about the results and lessons learned can be found here. The poster entitled "Switchable Directional Antenna System for UWB-based Internet of Things Applications" presented by Bernhard Grosswindhager at the International Conference on Embedded Wireless Systems and Networks (EWSN 2017) won the best poster award. The poster is the result of work in the "Dependable Wireless Communication and Localization" subproject. Mustafa Bakr from the "Dependable Wireless Communication and Localization" subproject has received the Microwave Theory and Techniques Society (MTT-S) Graduate Fellowship for 2017. The LEAD project organizes a Spring School on "Security and Correctness in the Internet of Things", registration deadline April 16, 2017. During the five-day school, participants will gain awareness of these IoT-related challenges. Introductory classes are supplemented by advanced courses in the area of system security, cryptography as well as software and hardware side-channels. During spare time participants are invited to enjoy the beautiful spring in Graz and attend organized events. For further information please visit: school.iaik.tugraz.at. Date: November 18, 2016, at 13:30. Localization is a commonly accepted feature in today’s wireless networks. However, the availability of location information is bound to the use of specific hardware components (e.g. GPS receivers or UWB ranging devices), which are prohibitive on low-cost wireless communication hardware. Efforts to close this gap have lead to research activities on time-based localization in asynchronous wireless networks, which triggered the field of simultaneous localization and synchronization (SLAS). In this talk two practically relevant scenarios for SLAS are considered, and the most popular solution strategies are revisited. These strategies include classical and Bayesian estimation based on linearization, semidefinite relaxation or message-passing. Moreover, a network implementation of distributed SLAS is discussed, and open issues in current developments are leveraged. Smart production and Industry 4.0 are the focus of the Industry.Tech 2016 symposium, bringing together leading players from industry and academia. Prof. Römer will give an invited presentation on a dependable Internet of products and production systems. Four key researchers of the LEAD project will lead the research area 'Cognitive Products' in the COMET K1 Research Center Pro2Future on Future Products and Production Systems coordinated by Johannes Kepler University of Link. For more information visit this Webpage (in Germany only). The Styrian Green Tech Cluster is a leading cooperation of industry and academic partners in the areas of green energy, buildings, and resources. The LEAD project will be presented at the Innovators Club, organized by the cluster on October 19. The LEAD project will be present with a booth in the FutureWorld science exhibitation at the Grazer Herbstmesse with expected 70.000 visitors. We will show two demonstrators on autonomous platooning of trucks and accurate positioning of trucks, with a special emphasis on how radio interference can disturb these functions. The 14. Workshop on "Automotive Software Engineering" addresses methods and tools for the development of dependable software for future cars on their way towards smart mobility and autonomous driving. Members of the LEAD project will deliver a course on "Dependable Internet of Things Communications" at the Microsoft Summer School on Internet of Things (SSIoT) held in Kazan, Russia. The course illustrates state-of-the-art low-power wireless communication protocols and gives an overview of the influence of the environment on their performance. It also discusses the challenges in understanding and predicting the environmental impact, examples of environment-aware communication protocols, as well as the common issues in implementing complex functionalities on resource-constrained smart objects. The participants also have the chance to gain hands-on experience and apply learned concepts through practical exercises using the Contiki operating system. Prof. Friedemann Mattern, professor of computer science at ETH Zurich and currently visiting professor at the Institute of Technical Informatics at TU Graz, will deliver this year's Nikola Tesla Lecture "The Internet of Things and the new digital revolution" on June 9 at 18:00 in the Ulrich-Santner lecture hall. Dedicated station for Dependable Things at the Lange Nacht der Forschung on April 22, 2016: "Wie sicher ist unsere smarte, neue Welt? "- "How dependable is our smart new world?". More information available here. Self-driving cars, individual product from the assembly line, and tiny sensors in aqueducts: in the near future the Internet of Things will permeate our daily lives with smart objects operating autonomously. However, in safety-critical application scenarios such as road traffic, they will be expected to operate dependably. Side-channel analysis (SCA) and physical attacks have become an important field of research at universities and in the industry. In order to enhance the resistance of cryptographic and security critical implementations within the design phase, constructive attacks and analyzing techniques may serve as a quality metric to optimize the design and development process. Since 2010, COSADE provides an international platform for researchers, academics, and industry participants to present their work and their current research topics. It is an excellent opportunity to exchange on new results with international experts and to initiate new collaborations and information exchange at a professional level. The workshop will feature both invited presentations and contributed talks. The LEAD project coordinator contributed to the "US-Europe Invited Workshop on Next-Generation Internet of Things" where future IoT research challenges have been identified. A report on these findings is now available here. Industry dialogue talk in the Aula of TU Graz on March 8 at 19:00: "Cyber Physical Systems - Die Technologie für alle Lebenslagen". Both the coordinator of the DependableThings center Prof. Kay Römer, as well as the deputy head, Prof. Roderick Bloem will be invited speakers in the panel with industry. Great Success for EWSN 2016! Great success for the EWSN 2016 conference held in Graz on February 13-17. Among others, the conference also hosted a dependability competition during which 11 teams from academia and research institutions from all over the world have battled to provide the most reliable and efficient networking solution for wirelessly networked embedded systems operating in environments rich with radio interference. The results and awards have been presented on Tuesday morning during a plenary dedicated dependability competition session. More information is available here. Das Fachgruppentreffen sowie die Winter School on Operating Systems widmet sich daher dem Einfluss von Systemsoftware auf die Verlässlichkeit (Dependability) Eingebetteter Systeme. The International Conference on Embedded Wireless Systems and Networks (EWSN) is a highly selective single-track international conference focusing on premier research results at the intersection of embedded systems and wireless networking – an area of highest relevance for visionary technologies such as the Internet of Things or Cyber-Physical Systems and application domains such as Smart Production, Smart Cities, or Connected Cars. The featured topic of the 2016 edition of EWSN is “Dependability”, i.e., on solutions that aim at making networked embedded systems more reliable, predictable, safe, and secure in order to enable critical applications that require guaranteed performance. Prof. Fredrik Tufvesson from Lund University will deliver a guest lecture entitled "Massive MIMO - from theory to practice" at TU Graz on January 22, 2016, at 14:00 in the Seminar Room IDEG134, Inffeldgasse 16c, ground floor. Localization and tracking technologies for portable devices use a wide variety of networks including cellular, satellite, and WiFi, and are critical for a wide range of applications such as navigation, E911 response, location-based services, location-dependent advertising, and location-based smartphone apps. Technologies for these "conventional" use cases will continue to advance as a result of improved algorithms, better fusion of multiple tracking modes, new network architectures, and improved sensor technologies. The workshop aims to attract recent work in all areas of localization, with an emphasis on physical-layer techniques. Location: TU Graz, Lecture Hall i11, Inffeldgasse 16b, basement. Smart and self-driving cars will change our daily lives significantly and are expected to have a transformational impact on society. First test drives with individual vehicles have already been successful and raise high expectations on future mobility concepts. These range from more convenience in travelling, over accident prevention and improved road logistics, to completely self-organizing traffic with a vast number of fully autonomous and seamlessly interacting cars. Realizing these visions requires substantial research on automotive embedded computing and networking in order to manage the significantly increased complexity of real-time information processing. The goal of this one-week summer school is to survey fundamental and applied aspects of embedded automotive computing and networking for Smart Cars, as well as to identify novel opportunities and research directions in related areas through a series of lectures held by international experts.